I love Bourdage Chiropractic because we have such an amazing team who are like family and wonderful patients. I love to spend time with my husband and my daughters Joi Mei and Jolie. Bing grew up in Toronto, Canada and has lived in Chicago since 2000. 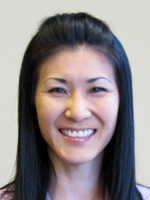 She has been the Office Manager of Bourdage Chiropractic since its opening in August 2008. She enjoys working alongside her husband, Dr. Steven Bourdage, helping patients improve their health and live a chiropractic lifestyle. She handles accounts receivable, payable, insurance and back office work. Feel free to say hi to her as you pass by her office. She brings positive energy and tranquility to the office as she helps to give back to the community by setting up events and talks for Dr. Bourdage to educate and promote awareness of chiropractic and wellness. Bing enjoys motherhood and going to the movies. She loves a great cup of coffee and spending time with family and friends. That I love to play billiards and Snooker. I won a trophy in the Chicago pool league for the women’s all-star tournament. I also played classical piano for 13 years through the Royal Conservatory of Music in Canada. I am spending time with my son and daughter either at a school function or having fun, enjoying each other’s company. When we’re together there is non-stop laughter and silliness. I am a poet and have recorded a lot of my poetry pieces to music on a CD that was released in 2008. I have also performed all over the City of Chicago, as well as New York, Atlanta and California. Elisha grew up on the northwest side of Chicago. 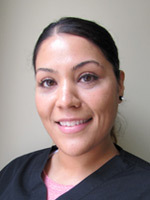 She began working in the healthcare industry as a Licensed Massage Therapist in 2006. During this time, she also gained knowledge of the insurance, billing and coding aspect of the industry. After 10 years as a massage therapist, she decided it was time to assist patients on the other end of the healthcare spectrum. I believe Dr. Bourdage is a great Doctor, and genuinely has the best interest of every patient at hand. The office has a family oriented feel that emanates from the staff and carries through to our patients. We work together as a team to care for and treat all of our patients to the best of our ability. Her compassion and desire to work closely with patients continues at Bourdage Chiropractic as an insurance and billing coordinator, which she began in January of 2015. She is available to answer any and all of your questions pertaining to insurance and financials.